Let me elaborate on the run mentioned above…. 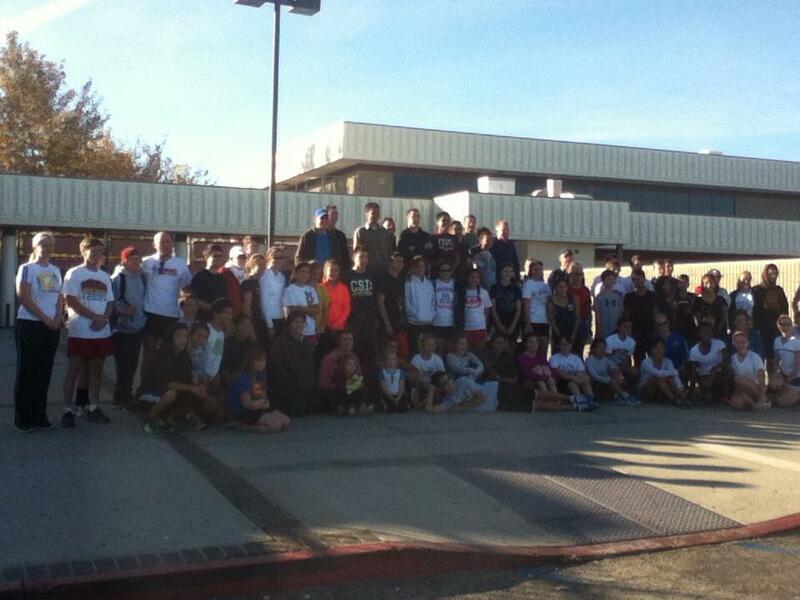 This morning at 8 am, at Highland High School there was a run in support of Jeff Smith. 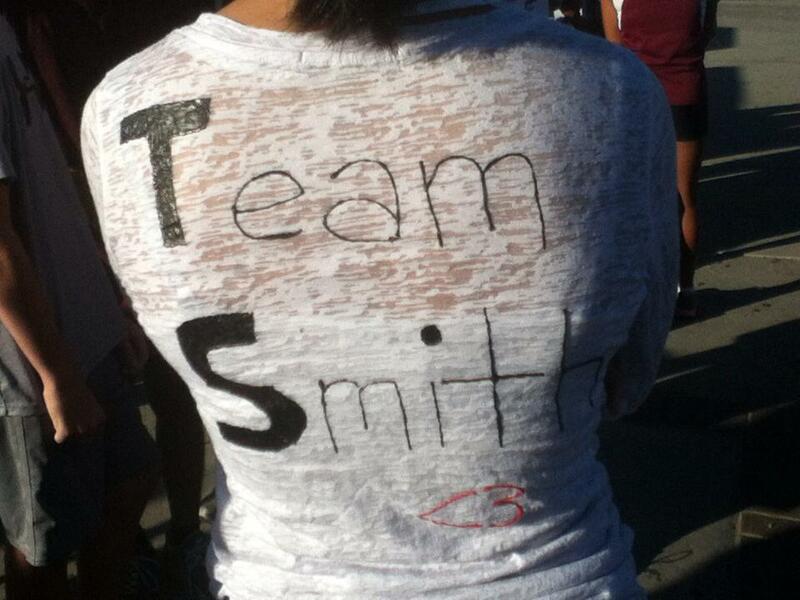 Some of the students at the run today, trying to show their support for coach Smith made shirts! 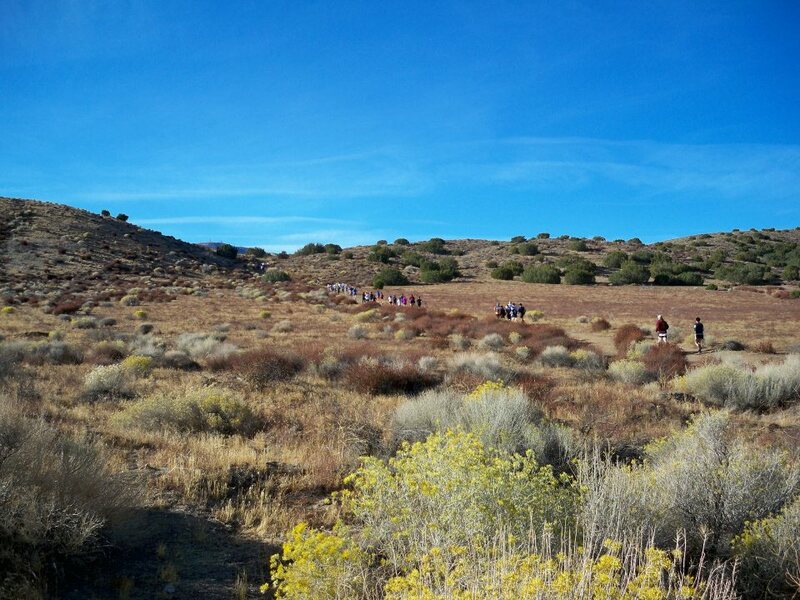 There were runners from Highland, Quartz Hill High, Paraclete, Hillview and more there. 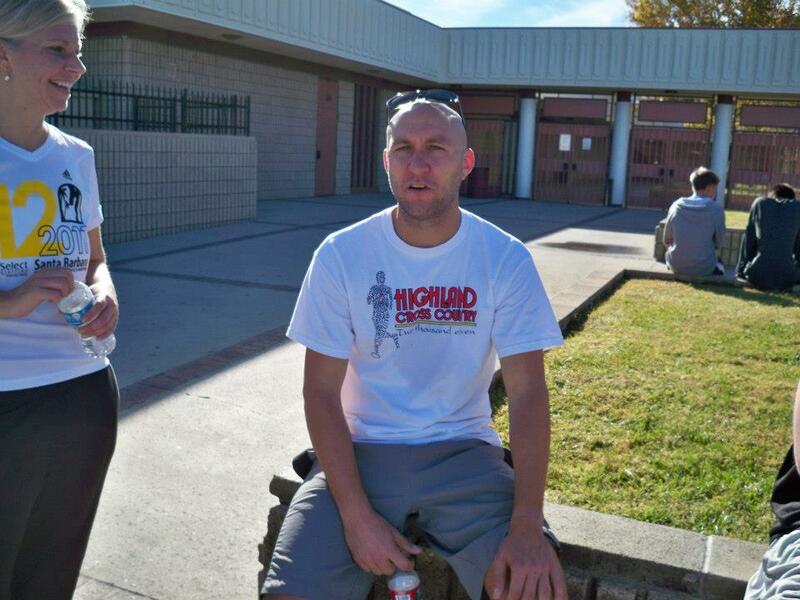 Coach B from Quartz Hill was caught here were a Highland shirt! We did actually go for a run. We ran from Highland over the saddle at P8/30th and up P12 until the pavement ended – about 4 miles round trip. I realize I have neglected to post anything about my own training the last few days. So, let me catch up. Monday I went to Clay’s for a 6:20 am strength and conditioning workout. I did the same routine as last Monday. It took me a little longer. I do not seem to be progressing much on the strength front lately. I attribute this to the fact that I have stepped on the running training. I am typically pretty fatigued when I attempt these workouts Clay devises for me. After the workout at Clay’s I headed over to Marie Kerr Park. I met a few of my students there for a run. We did the Marie Kerr Park to “Gilligan’s Island” loop. We paused at the aqueduct access road for 10 reps of 10s on the uber steep hill. By the time this was finished I was pretty wiped out. I have been fighting what I believed could be a sinus infection. I headed over to urgent care and got some antibiotics and zyrtec. Cheryl and I ran some errands and then I slept most of the afternoon. Tuesday, I coached the kids through a morning workout thinking that I would run in the evening. In the evening, I coached a reduced HDR track workout. It was reduced due to the fact that everyone there was planning on running the Turkey Trot Thursday. I decided that Tuesday would be my rest day. I did not run. Today, I headed back to Clay’s for a somewhat shorter tamer workout. I still do not seem to have the stamina I had a few weeks ago on the ski erg. I then headed to Marie Kerr and told the two or three students that were arriving that I was canceling the Hillview workout in order to attend the above mentioned Team Jeff Smith workout. A couple of them already knew about it and were planning to go along. The other two boys, were there with their college age sister (a former science student who at that time did not run.) The sister is on the track team at Cal State Humbolt Beach so I believe they stayed in the park and got in a workout. 9 miles and two strength workouts so far this week. I should be sufficiently tapered, but now that I think about it, the sinus infection could be the cause for the weakness I am seeing on the ski erg. It could adversely affect my attempt at a speedy 5K race tomorrow.